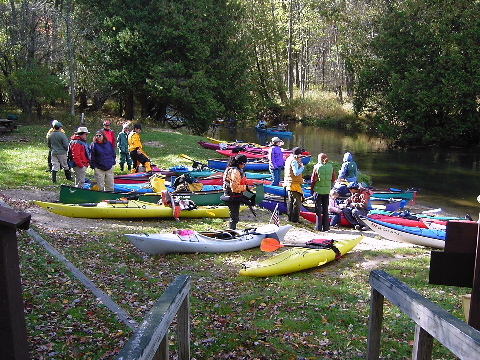 We had 25 kayaks and canoes with 28 people representing several of the paddling clubs in Michigan, as well as paddlers up from Ohio to enjoy the beautiful fall scenery on the Pine. Weather was crisp at night but the sun made the whole event enjoyable. I will elaborate shortly…. Heading up Friday night I thought the traffic was unusually heavy and the construction specifically intended to slow my progress. I just wanted to GET THERE and see if anyone else was going to show up. I had heard reports that Peterson Bridge Campground was closed for the season and was worried about people showing up there and trying to figure out where to go. I pulled into the campground and it was 2/3 full with campers, kayaks, and canoes. “They can’t all be here for this trip, can they?” I thought to myself. People continued to arrive and more camps set up. I saw familiar faces and new ones. Shortly before 9:00 a.m. Saturday morning the parade of vehicles to the launch site gave evidence to the number of paddlers out that day. We filled the parking lot at Dobson Bridge in preparation for shuttle, and then packed the parking lot at the launch site at Walker Bridge shortly thereafter. It took us almost 45 minutes to launch all of the boats, with the lead boater being almost a mile downriver before the last boat was launched. We met up all together again for lunch at Elm Flats where the above photo was taken. The kayak to canoe ratio was 3:1 with almost every color you could imagine. The variety of boat manufacturers and designs was amazing, from simple recreational kayaks to whitewater kayaks, from tiny solo canoes to tandems. The range in ages was even more interesting: from 4 years old to 75. The common denominator was our love for the river and our passion for paddling. People who had never met before were immediately friends with the common bond of water. There were a few capsizes due to the occasional log or branch, but proper clothing and a sunny sky mitigated the cold water and cool breeze. Even though the group was stretched out on the run back to Dobson Bridge, rarely was anyone out of sight of someone else. By the time we reached Dobson Bridge the sunshine on the sand almost felt hot. We loaded up and headed back to camp for our various dinner plans. We wandered around from site to site sharing the plentiful food where possible. Sunday morning brought temperatures approaching freezing, but overcast skies brough the ambient temperature up into the 40’s and then 50’s realtively quickly. There were a few less paddlers on the water in our group today, so it gradually seperated us to an almost solo experience. There was always someone just ahead or just behind but many times you had the bend in the river to yourself. It is easy to get introspective and lost in one’s own thoughts at times like this. The boat feels motionless while the banks slide effortlessly past. I get the sensation that I can actually feel the earth revolve under me as I become the still point in my own universe. There is no arrogance in this centeredness, only a release of self and acceptance of your place in the world. Alas, the end approaches and the last rapid above the site of the Old Stronach Dam removal requires one last moment of attention. Boats are hauled up on shore and the sound of cars starting their engines wipes out the last quiet thoughts of this journey. The rain finally begins to fall on the way home, so that even the last vestiges of the trip are wiped from the vehicle, and only the digital images in my camera and the memories in my soul remain to enjoy this wonderful weekend on the Pine. It’s time to plan the next trip…. This entry was posted in Pine River, Trips, Uncategorized. Bookmark the permalink. I paddled with Jay’s group Sunday only from Dobson Bridge to Low Bridge–about 11.5 miles–in a solo canoe. Arms are still sore on Tuesday (ibuprofen–breakfast of champions) but had a great time. The Pine is a busy little river, not raging whitewater, but plenty fast and lots of obstacles to dodge. I think 50 percent of my strokes were draw strokes. I too enjoyed the huge variety and color of the boats and the company of other paddlers. Jay, I’m in the process of linking to a photo gallery so you can post up more photos of the trip. Should have it done by the weekend.